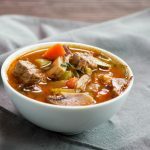 A Low Carb Instant PotⓇ or Stovetop Hearty Beef Stew that is a tasty, gluten-free, paleo, warm comforting meal. 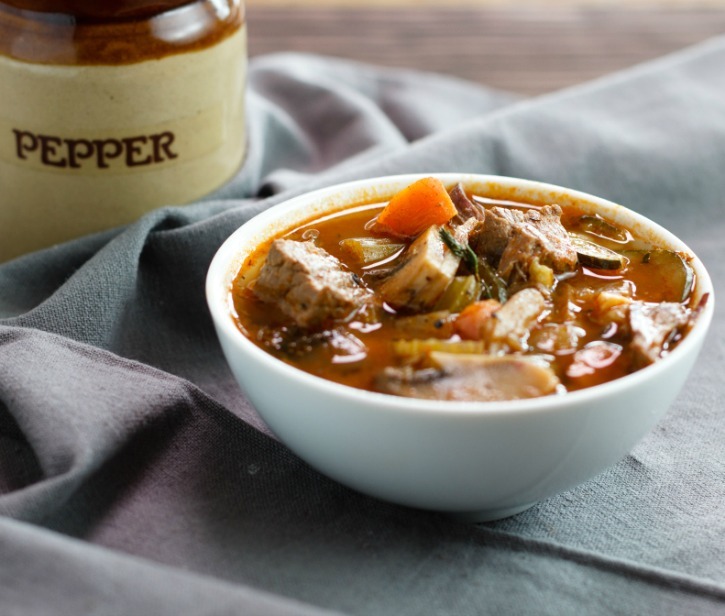 Made with seared beef stew meat and vegetables in a rich beef broth. 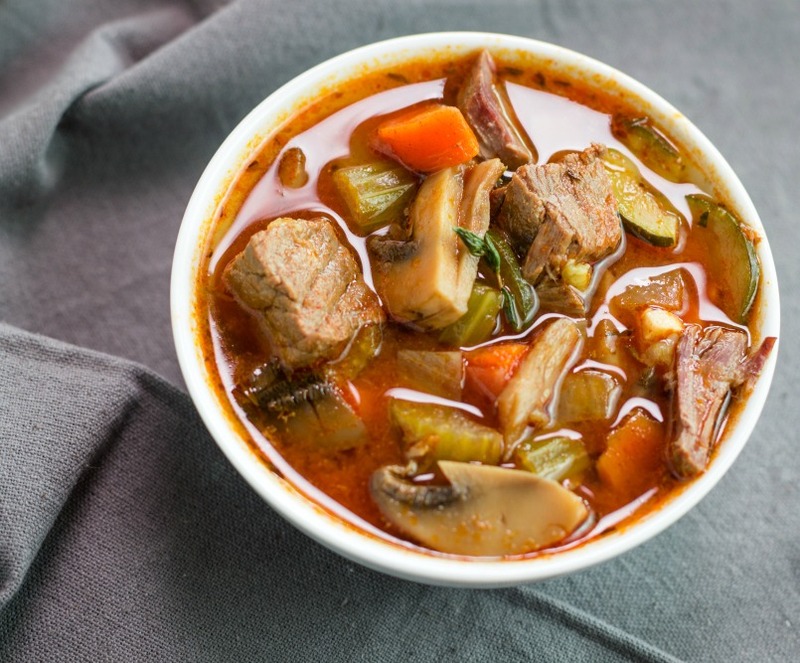 A hearty, full-bodied and comforting low carb and paleo beef stew that is very satisfying on a chilly evening. 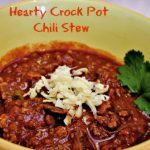 Made easily in the Instant Pot or on the stovetop with directions for both methods included. I replaced the potatoes typically put in a beef stew with zucchini and mushrooms to keep the carb count low, but you won’t even miss them in this savory, comforting stew. I also used a minimal amount of arrowroot powder although not a low carb ingredient in more substantial amounts, it is more concentrated and used in much smaller quantities than using cornstarch as a thickener, which also keeps the carbs lower. However, you can omit the arrowroot powder as it is just added to thicken the broth slightly and I do leave it out sometimes when I make this. Also, I have noticed that any leftover stew that is refrigerated overnight will also thicken the broth and even when reheated, it is still slightly thicker, and the flavors will intensify as well! In a large mixing bowl add cubed beef, arrowroot powder, and sea salt. 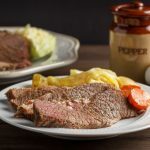 Turn beef with a large spoon to coat in the powder. Set aside. Press the Saute button twice (for the “more or high”setting) and add the olive oil to the inner pot of the Instant Pot. Once hot, add cubed beef stew meat and brown on all sides for about 5 minutes or more. Once the meat has browned, add all the remaining ingredients to the pot and stir to combine. Scrape the bottom of the pot with the spoon to loosen any stuck bits of beef. Close and secure the Instant Pot lid. Turn the pressure release handle to the Sealing setting. Select the Stew/Meat setting on High Pressure. Press the + or – buttons to set cooking time for 30 minutes. Once cooking time is complete, use the Natural Release method for 10 minutes and then carefully Quick Release the remaining pressure. Open the lid, stir the stew and serve. In a large stock pot over medium high heat add avocado oil. Once the oil is hot add stew meat and brown on all sides for 6 minutes or more until browned. Once the meat has browned, scrape the bottom of the pot with a spoon to loosen any stuck bits of meat. Add all the remaining ingredients to the pot and stir to combine. Turn up the heat to high and bring the pot to a boil. Once boiling, lower heat to medium-low or low, cover pot and simmer for 40 minutes. Remove lid, stir and serve. Once hot, add cubed beef stew meat, and brown on all sides for about 5 minutes or more. Close and secure the Instant Pot lid. Turn the pressure release handle to the Sealing setting. Select the Stew/Meat setting on High Pressure. Press the + or - buttons to set cooking time for 30 minutes. In a large mixing bowl add cubed beef, arrowroot powder and sea salt. Turn beef with a large spoon to coat in the powder. Set aside. Add all the remaining ingredients to the pot, and stir to combine. Turn up the heat to high and bring the pot to a boil. Could I leave out the tomatoes? 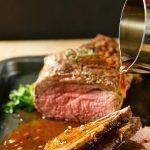 My husband is going keto and I know he can’t have them. Would it still taste good it looks delicious! The tomato sauce is added for texture, color and flavor, but you could possibly use another puree. Maybe pumpkin might work. I’m not sure though. Thank you, Terlyno, roasted peppers would be a great sub. Dear Stacey, Your recipe and presentation of it are gorgeous. I really want to try this. I LOVE the nutritional information yo u provided. I am ssorry there is no sodium info. I have to watch every speck of sodium. Thanks for sharing your talents. Thank you so very much, Lori, I can add the sodium info on the nutritional info. 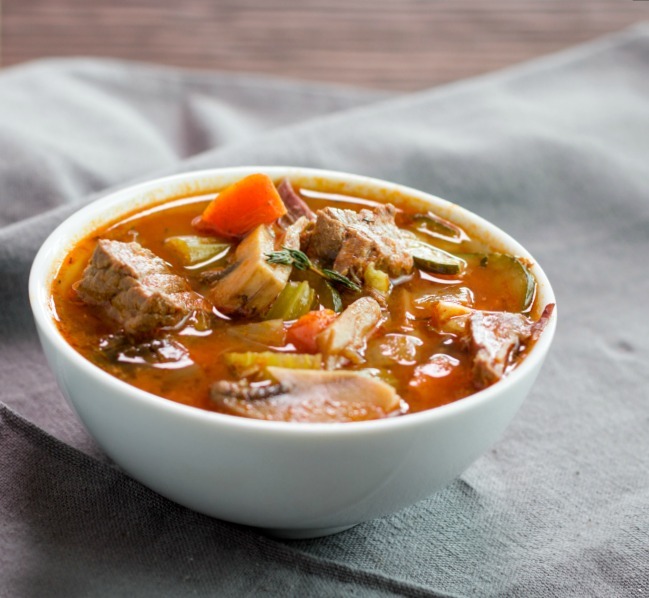 For a lower sodium count use stock instead of broth and reduce or omit the sea salt. Yes, do you think radishes and turnips would add well? Sounds really good. Pam, I think they would be good in there and would also add a subtle peppery bite to the stew! This is such as tasty meal! Thanks so much for this stew especially as we had a cool weekend and Autumn has certainly kicked in. I wouldn’t normally have mushrooms in a beef stew so will try this. This looks so good and perfectly comforting for the chilly weather we’ve been having! I also love rosemary and thyme together, and this looks so flavor packed! 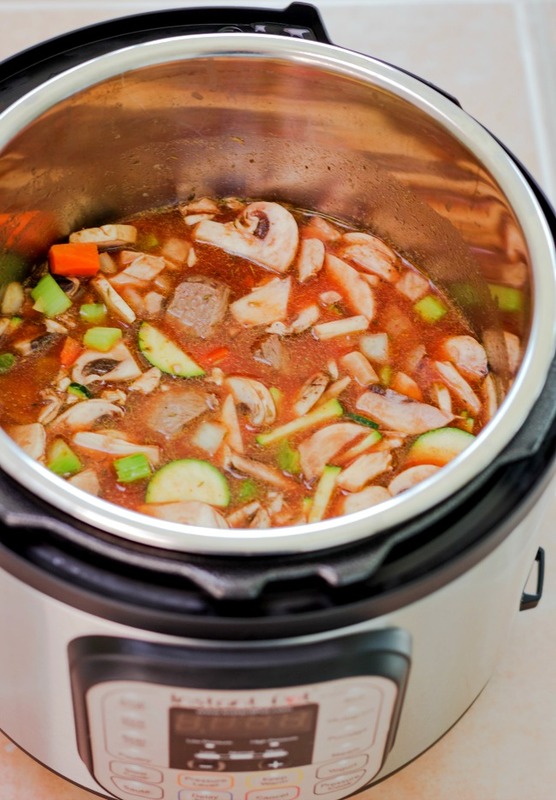 I love how flavorful this beef stew is and best all is Instant Pot and Low carb. YUM! So easy and so yummy! Made this last night, and it was a total hit with the whole family. Thank you, Katja for giving it a try! Gorgeous recipe. 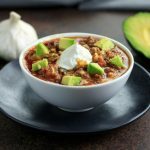 I will definitely be doing this in my Instant Pot! Thank you for all the tips to make this successful in the IP! It is definitely gearing up for stew weather – I can’t wait! So comforting and nourishing this time of the year! I love the addition of all the veggies! It’s definitely soup season, and I love how comforting and hearty this looks! So excited to dust off my instant pot for this. I love how loaded this stew is with all of the produce, especially the mushrooms. I love mushrooms in beef stew! The IP cooks this so beautifully too. Yum! I love mushrooms too, Emily! Love this simple and comforting stew! Looks so cozy and warm…and so many delicious veggies in the mix! What about radishes in the place of the potatoes? Craig, radishes are a great idea!